For some in the wine industry, marketing is nothing more than letting the public know you have opened a winery and that you are lending your name to a wine label. Wayne Gretzky, the famous retired NHL Hockey great is one example that comes to mind. Others like Mike Ditka and Joe Montana from the football world, or Richard Childress and Mario Andretti for those in the racing community, are still more whose names give visibility to their marketing efforts. The list goes on and on. But what about folks like an Upstate New York farming family, the Hurlbuts? 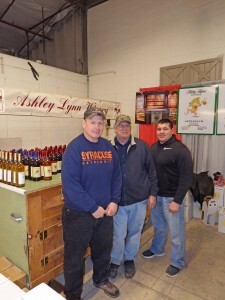 How might these, Mexico, NY, apple growers, and owners of the Ashley Lynn Winery get the word out? They have been vintning a line of delightful apple wines for more than a decade, and yet, to other than their neighbors, family and friends, their name isn’t anywhere near as recognizable as the ones we’ve mentioned thus far. That’s where innovative thinking and a desire to share their quality products comes in. Over time, the Hurlbuts have found that trade shows and state and county fairs, are the answer. This is the best way for them to market their label! 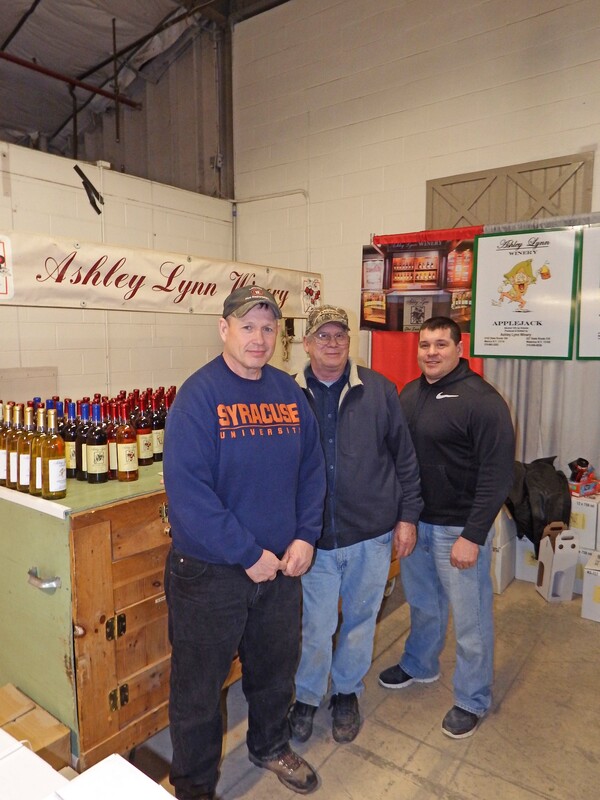 At the recent Hard Hat Expo in Syracuse, NY, the Hurlbuts of Ashley Lynn Winery surprisingly had a colorful exhibit prominently located among the trucks, dozers and other construction equipment and services on display at this annual trade show. When they requested to be a part of this year’s event, trade show manager, Ken Maring, was uncertain the Hurlbuts actually were requesting an exhibit space in the right event. After confirming with them that yes, they indeed wanted to be a part of this highly recognized construction industry event, Maring agreed they could be a part of the show. This is nothing out of the ordinary for the Hurlbut family. “We attend more between 25 and 30 trade shows and county fairs every year,” said Craig Hurlbut. “Sometimes show promoters wonder if we really do want to be a part of their event. We really do. When the husband is at a show like the Hard Hat Expo, where he’s shopping for a new truck or other piece of equipment, he can take home some bottles of wine for his wife as a gift to remind her that she is important to him as well. Shows like this are a nice venue for us to promote our winery,” he said. Hurlbut said his father and mother began making and selling apple wine as part of their orchard operation about 15 years ago. They learned that by doing farm shows, garden shows and various other trade shows, they were able to get their name out across New York State. At the same time, they were able to sell product to help offset the cost of attending the shows. “We offer 13 apple wine flavors and we have two new products as well,” said Craig. Hurlbut said because of the growth of their wine business, one group of family members takes care of the orchard while the others devote their time to wine making. For years, they’ve sold their produce at their family-owned farm market and recently, they’ve added a second farm market which also serves as a second wine retail store. Venturing into the retail sales world, Hurlbut said they are excited about their first retail wine shop that is scheduled to open in the Destiny Mall in Syracuse, very soon. “We are looking forward to the growth of our business in this way as well,” he said. For more information about Ashley Lynn Winery, visit their website at AshleyLynnWines.com or check them out on Facebook.